The Earth's Atmosphere The atmosphere surrounds Earth and protects us by blocking out dangerous rays from the sun. The atmosphere is a mixture of gases that becomes thinner until it gradually reaches space. It is composed of Nitrogen (78%), Oxygen (21%), and other gases (1%). Oxygen is essential to life because it allows us to breathe. In addition, some of the oxygen has changed over time forming ozone. The ozone layer filters out the sun's harmful ultraviolet radiation. Recently, there have been many studies on how humans caused a hole to develop in the ozone layer. Humans are also affecting Earth's atmosphere through the greenhouse effect. Due to increases in gases, such as carbon dioxide, that trap heat being radiated from the Earth, scientists believe that the atmosphere may have problems balancing the incoming solar radiation and the reradiated heat from Earth's surface creating the greenhouse effect. The atmosphere is divided into five layers depending on how temperature changes with height. Most of the weather occurs in the first layer. Layers of the Earth's Atmosphere The atmosphere is divided into five layers. It is thickest near the surface and thins out with height until it eventually merges with space. • The troposphere is the first layer above the surface and contains half of the Earth's atmosphere. Weather occurs in this layer. • Many jet aircraft fly in the stratosphere because it is very stable. Also, the ozone layer absorbs harmful rays from the Sun. • Meteors burn up in the mesosphere. • The thermosphere is a layer with auroras. It is also where the space shuttle orbits. • The atmosphere merges into space in the extremely thin exosphere. This is the upper limit of our atmosphere. The Troposphere The troposphere is the lowest region of the Earth's atmosphere, where masses of air are very well mixed together and the temperature decreases with altitude. The air is heated from the ground up because the surface of the Earth absorbs energy and heats up faster than the air. The heat is mixed through the troposphere because on average the atmosphere in this layer is slightly unstable. Weather occurs in the Earth's troposphere. In fact, most clouds form in this layer. The Stratosphere In the Earth's stratosphere, the temperature increases with altitude (as opposed to the troposphere, where it gets colder with altitude). The increasing temperature in the stratosphere is caused by the presence of a layer of ozone near an altitude of 25 kilometers. The ozone molecules absorb high-­‐energy UV rays from the sun, which warm the atmosphere at that level. The terrestrial stratosphere is the region between the tropopause, or the end of the troposphere, and the level at which the maximum warming due to the presence of ozone takes place, which is at an altitude of about 50 kilometers. This text is derivative from content on Windows to the Universe® (http://windows2universe.org) ©2010, National Earth Science Teachers Association. Ozone The Ozone Hole. The Ozone Hoax. Pollution. Skin Cancer. The topic of ozone makes headlines on a regular basis, but why does a single molecule merit such media coverage? How important is the ozone in our atmosphere and why are scientists so concerned about its increase near the surface of the Earth and its disappearance higher up in the atmosphere? First things first -­‐ what is ozone? Ozone is made of three oxygen atoms (O3). The oxygen in our atmosphere that we breathe is made up of two oxygen atoms (O2). Because of its chemical formulation, a single atom of oxygen (O) is unstable. That is, it wants to combine with something else. That is why oxygen is almost always found in pairs, in its (diatomic) form, where it is more stable. (O3) is less stable than (O2), because it wants to return to the diatomic state by giving up an oxygen atom. When enough ozone molecules are present, it forms a pale blue gas. Ozone has the same chemical structure whether it is found in the stratosphere or the troposphere. Where we find ozone in the atmosphere determines whether we consider it to be Dr. Jekyll or Mr. Hyde. In the troposphere, the ground-­‐level or "bad" ozone is an air pollutant that damages human health, vegetation, and many common materials. It is a key ingredient of urban smog. In the stratosphere, we find the "good" ozone that protects life on Earth from the harmful effects of the Sun's ultraviolet rays. We have good reason to be concerned about the thinning of the ozone layer in the stratosphere. We also have good reason to be concerned about the buildup of ozone in the troposphere. Although simplistic, the saying "Good up high and bad near by," sums up ozone in the atmosphere. About 90% of the ozone in the Earth's atmosphere lies in the region called the stratosphere which is found between 16 and 48 kilometers (10 and 30 miles) above the Earth's surface. Ozone forms a kind of layer in the stratosphere, where it is more concentrated than anywhere else, but even there it is relatively scarce. Its concentrations in the ozone layer are typically only 1 to 10 parts of ozone per 1 million parts of air. Ozone and oxygen molecules in the stratosphere absorb ultraviolet light from the Sun, providing a shield that prevents this radiation from passing to the Earth's surface. While both oxygen and ozone together absorb 95 to 99.9% of the Sun's ultraviolet radiation, only ozone effectively absorbs the most energetic ultraviolet light, known as UV-­‐C and UV-­‐B, which causes biological damage. The protective role of the ozone layer in the upper atmosphere is so vital that scientists believe life on land probably would not have evolved -­‐ and could not exist today -­‐ without it. The term "shield" as a description of ozone in the stratosphere is a bit misleading because the molecules do not form an impermeable sphere around the Earth. Ozone continuously breaks apart into its oxygen atoms and reforms as ozone molecules, so a particular ozone molecule doesn't last very long. The "shield" changes constantly, but the atmospheric chemical processes maintain a dynamic equilibrium that keeps the overall amount of ozone constant -­‐ that is, it would if humans did not contribute to the chemical processes. There is compelling scientific evidence that ozone is destroyed in the stratosphere and that some human-­‐released chemicals such as CFC’s are speeding up the breakdown of ozone in the atmosphere. This text is derivative from content on Windows to the Universe® (http://windows2universe.org) ©2010, National Earth Science Teachers Association. While the stratospheric ozone issue is a serious one, in many ways it can be thought of as an environmental success story. Scientists detected the developing problem, and collected the evidence that convinced governments around the world to take regulatory action. Although the global elimination of ozone-­‐depleting chemicals from the atmosphere will take decades yet, we have made a strong and positive beginning. For the first time in our species' history, we have tackled a global environmental issue on a global scale. The Mesosphere In the Earth's mesosphere, the air masses are relatively mixed together and the temperature decreases with altitude. Atmospheric temperatures reach the lowest average value of around -­‐90°C in the mesosphere. This is also the layer in which a lot of meteors burn up while entering the Earth's atmosphere. The mesosphere extends from the top of the stratosphere (the stratopause, located at about 50 kilometers) to an altitude of about 90 kilometers. Upper reaches of the atmosphere, such as the mesosphere, can sometimes be detected by looking at the limb of a planet. The Thermosphere The Earth's thermosphere is the layer of the atmosphere which is first exposed to the Sun's radiation and so is first heated by the Sun. The air is so thin that a small increase in energy can cause a large increase in temperature. The temperature in the thermosphere is very dependent on solar activity. When the Sun is active, temperatures can reach up to 1,500°C or higher! Because of the thin air in the thermosphere, scientists can't measure the temperature directly. They measure the density of the air by how much drag it puts on satellites and then use the density to find the temperature. The thermosphere also includes the region of the Earth's atmosphere called the ionosphere. The ionosphere is the region of the atmosphere that is filled with charged particles. Elevated temperatures can sometimes cause a molecule to become ionized, therefore, the ionosphere and thermosphere can overlap. The Exosphere At very high alititudes, the atmosphere becomes very thin. The region where atoms and molecules escape into space is referred to as the exosphere. This is the true upper limit of the Earth's atmosphere. The exosphere extends from the thermosphere out to space. The Ionosphere Scientists call the ionosphere an extension or a part of the thermosphere. So technically, the ionosphere is not another atmospheric layer, but a region of the atmosphere. The ionosphere represents less than 0.1% of the total mass of the Earth's atmosphere. Even so, it is extremely important! The upper atmosphere is ionized by solar radiation. Under normal conditions free electrons and ions tend to recombine and a balance is established between electron and ion production and loss. Ionization processes release energy which heat up the upper atmosphere. So temperature increases with height in the ionosphere region to the extent that by 150-­‐200km, the Earth's atmosphere is extremely hot compared to surface temperatures. This text is derivative from content on Windows to the Universe® (http://windows2universe.org) ©2010, National Earth Science Teachers Association. Different regions of the ionosphere make long distance radio communication possible by reflecting the radio waves back to Earth. It is also home to auroras and the mega-­‐ampere currents that heat the atmosphere at high latitudes during geomagnetically active times. During storms, depletions and enhancements of ionization occur depending on the local time and geographical location. Aeronomy is a term of recent origin which is applied to the processes, both physical and chemical, of the ionosphere. Regions of the Ionosphere The ionosphere can be further broken down into the D, E and F regions. The breakdown is based on what wavelength of solar radiation is absorbed in that region most frequently or on what level of radiation is needed to photodissociate the molecules found in these individual regions. The D region is the lowest in altitude, though it absorbs the most energetic radiation, hard x-­‐rays. The D region doesn't have a definite starting and stopping point, but includes the ionization that occurs below about 90km (or ionization that occurs below the E region). The E region peaks at about 105km. It absorbs soft x-­‐rays. The F region starts around 105km and has a maximum around 600km. It is the highest of all of the regions. 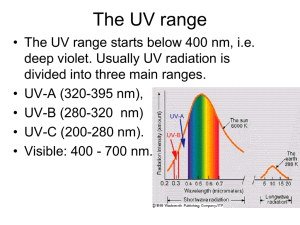 Extreme ultra-­‐violet radiation (EUV) is absorbed there. On a more practical note, the D and E regions (the lower parts of the ionosphere), reflect standard AM radio waves back to Earth. Radio waves with shorter lengths are reflected by the higher F region. Visible light, radar, television and FM wavelengths are all too short to be reflected by the ionosphere. So these types of global communication are made possible by satellite transmissions. The Sun's Effect on the Ionosphere Invisible layers of ions and electrons are suspended in the Earth's atmosphere above about 60 kilometers in altitude. The main source of these layers is the Sun's ultraviolet light which ionizes atoms and molecules in the Earth's upper atmosphere. During this process, called photoionization, an electron is knocked free from a neutral atmospheric particle, which then becomes an ion. Because the Sun's light is responsible for most of the ionization, the ionosphere reaches maximum densities just after local noon. In this region, at altitudes where the highest densities occur, about one in every 1000 air particles is ionized. Resulting ionospheric densities are about a million ions and electrons per cubic centimeter. Flares and other energetic events on the Sun produce increased ultraviolet, x-­‐ray and gamma-­‐ray photons that arrive at the Earth just 8 minutes later and dramatically increase the density of the ionosphere on the dayside. These solar events also can produce high velocity protons and electrons (arriving at Earth hours to days later) that precipitate into the ionosphere in the polar regions producing large increases in the density of the ionosphere at low altitudes. This text is derivative from content on Windows to the Universe® (http://windows2universe.org) ©2010, National Earth Science Teachers Association. NAME: ____________________________________________________Date: ___________________________Period: ___________ Student Worksheet After reading the background information complete the first data table. Data Table #1 Atm ospheric Layer Based on the background information, list important characteristics of each layer. Troposphere Stratosphere Mesosphere Thermosphere Exosphere Ionosphere This text is derivative from content on Windows to the Universe® (http://windows2universe.org) ©2010, National Earth Science Teachers Association. 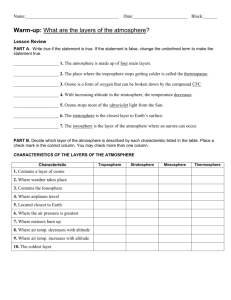 Refer to the graph “The Average Temperature Profile of the Earth’s Atmosphere” and complete the data table two. Data Table #2 Thickness (km ) (Hint: subtract) M axim um Tem perature (°C) Stratosphere Mesosphere Thermosphere Exosphere Ionosphere Atm ospheric Layer Exists between which altitudes (km ) Troposphere Study and analyze the graph “The Average Temperature Profile of the Earth’s Atmosphere” as you complete table 3: Data Table #3 Describe what happens to the tem perature as altitude increases. Be Atm ospheric sure to note specific altitudes where abrupt changes occur and how Layer each layer is heated. Troposphere Stratosphere Mesosphere Thermosphere Exosphere Ionosphere This text is derivative from content on Windows to the Universe® (http://windows2universe.org) ©2010, National Earth Science Teachers Association. 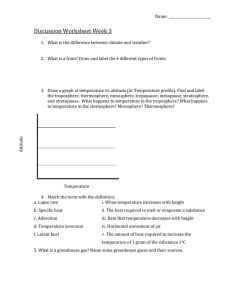 Analysis Questions: Study the graph, "The Average Temperature Profile of the Earth's Atmosphere". 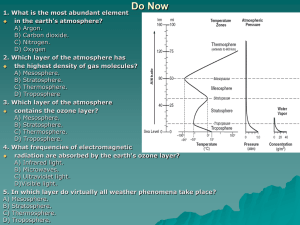 Does information there help you to explain why scientists decided where one layer of atmosphere ended and the next one began? Explain your answer. What important layer exists within the stratosphere? ____________________ What is the importance of this layer within the stratosphere? After reviewing the effects of both “good” and “bad” ozone, how do you think our lives would be different if the “good” ozone were destroyed? 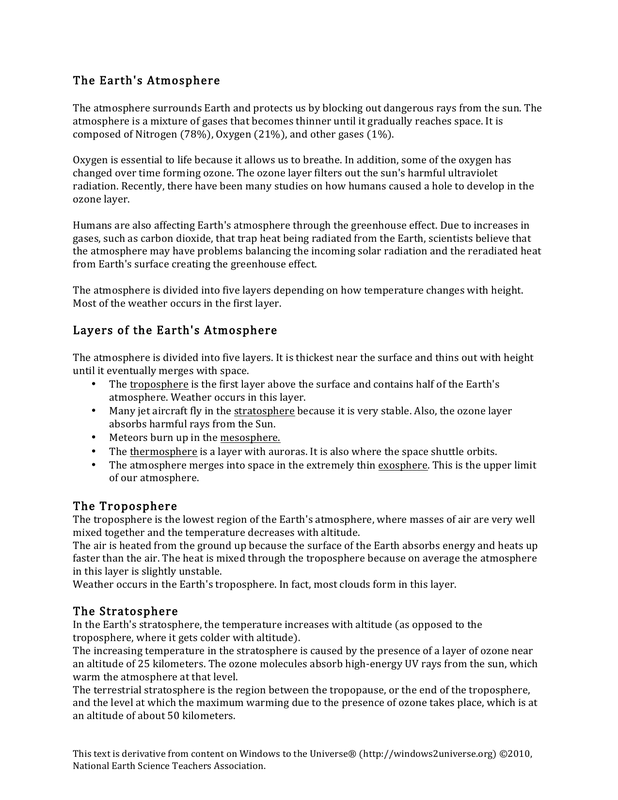 What important layer exists within the thermosphere? ___________________ What is the importance of this layer within the thermosphere? Summarize the differences between the D, E, and F layers. Be sure to pay close attention to which wavelengths of sunlight are absorbed and which wavelengths are reflected. Ionospheric Layer Characteristics F E D If the ionosphere did not exist, what do you think might be some possible consequences to humans? Think about which wavelengths the ionosphere blocks and what would happen if these wavelengths were allowed through the atmosphere to the Earth’s surface. How does an increase in solar activity affect the ionosphere? Why do you think this effect on the ionosphere is observed on the dayside and not the night side of the Earth? This text is derivative from content on Windows to the Universe® (http://windows2universe.org) ©2010, National Earth Science Teachers Association. What is photoionization? The Average Temperature Profile of Earth's Atmosphere This image is from Windows to the Universe® (http://windows2universe.org) ©2010, National Earth Science Teachers Association. This text is derivative from content on Windows to the Universe® (http://windows2universe.org) ©2010, National Earth Science Teachers Association. Layers (D, E, and F) of Earth's Ionosphere This image is from Windows to the Universe® (http://windows2universe.org) ©2010, National Earth Science Teachers Association. This text is derivative from content on Windows to the Universe® (http://windows2universe.org) ©2010, National Earth Science Teachers Association. NAME: ____________________________________________________Date: ___________________________Period: ___________ This text is derivative from content on Windows to the Universe® (http://windows2universe.org) ©2010, National Earth Science Teachers Association. 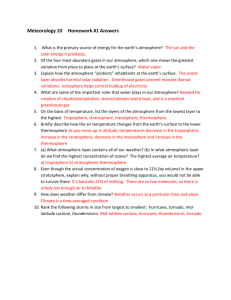 Student Worksheet Answer Key After reading the background information complete the first data table. Data Table #1 Atm ospheric Layer Based on the background information, list important characteristics of each layer. 1. Weather occurs here. 2. This layer contains half of Earth’s atmosphere. Troposphere 1. Jet aircraft fly here because it is very stable. 2. The ozone layer absorbs ultraviolet rays. 3. There is a temperature inversion due to the ozone layer. Stratosphere 1. Meteors burn up in this layer. 2. The mesopause is the coldest part of the atmosphere. Mesosphere 1. Aurora’s occur in this layer. 2. The temperature here is largely dependent on solar activity. 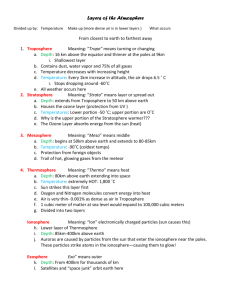 Thermosphere 1. This layer represents less than 0.1% of the mass of the atmosphere. 2. Different regions of this layer make long distance communication possible. Exosphere 1. Region where atoms and molecules escape into space. 2. Upper limit of the atmosphere. Ionosphere Refer to the graph “The Average Temperature Profile of the Earth’s Atmosphere” and complete the data table two. Data Table #2 This text is derivative from content on Windows to the Universe® (http://windows2universe.org) ©2010, National Earth Science Teachers Association. Atm ospheric Layer Exists between which altitudes (km ) Thickness (km ) (Hint: subtract) M axim um Tem perature (°C) Troposphere 0 -­‐ ~15 ~15 20 Stratosphere ~15-­‐50 35 -­‐2 Mesosphere 50-­‐85 35 -­‐2 Thermosphere 85-­‐600 515 400-­‐1500 (or higher) Exosphere ~60 – 600 ~540 Greater than 1500 Ionosphere 600 -­‐ up unknown Greater than 1500 Study and analyze the graph “The Average Temperature Profile of the Earth’s Atmosphere” as you complete table 3: Data Table #3 Describe what happens to the tem perature as altitude increases. Be Atm ospheric sure to note specific altitudes where abrupt changes occur and how Layer each layer is heated. Troposphere Describe what happens to the temperature as altitude increases. Be sure to note specific altitudes where abrupt changes occur and how each layer is heated. Stratosphere Temperature decreases. Earth absorbs electromagnetic radiation, re-­‐radiates it as infrared radiation (heat), which rises, expands, and cools. Mesosphere Temperature increases. The ozone layer absorbs ultraviolet radiation, heating the layer. Temperature decreases. Thermosphere Temperature increases due to solar radiation. Exosphere Ionosphere Temperature increases due to solar radiation. The ionization process releases energy which heats up the upper atmosphere. Temperature increases due to solar radiation. 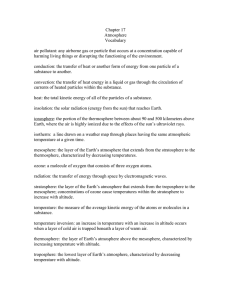 Analysis Questions: This text is derivative from content on Windows to the Universe® (http://windows2universe.org) ©2010, National Earth Science Teachers Association. Study the graph, "The Average Temperature Profile of the Earth's Atmosphere". Does information there help you to explain why scientists decided where one layer of atmosphere ended and the next one began? Explain your answer. Layers are divided by the behavior of the temperature. The point where temperature switches from warming to cooling (or cooling to warming) is where the boundary of the layers is located. What important layer exists within the stratosphere? Ozone What is the importance of this layer within the stratosphere? The ozone layer absorbs 97-­‐99% of the incoming ultraviolet radiation. After reviewing the effects of both “good” and “bad” ozone, how do you think our lives would be different if the “good” ozone were destroyed? If “good” ozone were destroyed, most of the incoming ultraviolet radiation would strike Earth, causing intense sunburns and an increase in skin cancer. 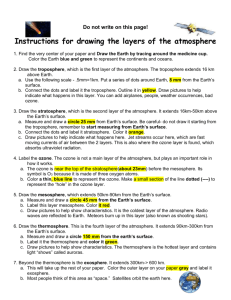 What important layer exists within the thermosphere? Ionosphere What is the importance of this layer within the thermosphere? The ionosphere makes long distance radio communication possible by reflecting radio waves back towards Earth. Summarize the differences between the D, E, and F layers. Be sure to pay close attention to which wavelengths of sunlight are absorbed and which wavelengths are reflected. Ionospheric Layer Characteristics F Absorbs extreme ultraviolet, reflects short wave radio waves. E Absorbs soft x-­‐rays, reflects AM radio waves. D Absorbs hard x-­‐rays, reflects AM radio waves. If the ionosphere did not exist, what do you think might be some possible consequences to humans? Think about which wavelengths the ionosphere blocks and what would happen if these wavelengths were allowed through the atmosphere to the Earth’s surface. X-­‐rays would strike Earth, causing cancer and long distance radio communication would require satellites. How does an increase in solar activity affect the ionosphere? Why do you think this effect on the ionosphere is observed on the dayside and not the night side of the Earth? The density increases with increased solar activity. What is photoionization? Photoionization is the formation of an ion when an electron is knocked free from a neutral atmospheric particle by ultraviolet radiation. This text is derivative from content on Windows to the Universe® (http://windows2universe.org) ©2010, National Earth Science Teachers Association.